I can’t express the seriousness of 2 bills which are in the process of being voted on in the next few days, and the effects that will result for truck driver wages. The time to action NOW. If the amendments, provisions, or language that has been introduced into the THUD or FAA bills are allowed to remain, the results will drastically result in truckers’ inability to be paid for all their time working. ( detention time, paper work, and all non driving time working) To summarize: Motor Carriers would legally not be obligated to pay drivers anything other than miles driven. Period. The dangerous language we are referring to,the Denham language, authored by a California Congressman named Jeff Denham, who is from the rural agricultural region of California called Modesto. The ATA and their carriers have invested over $111,000 in Jeff Denham making him their#4 political investment. It will mean that you will never, by law, be entitled to be paid for ALL your time working. In essence it means that truckers are only worth what they can produce ( while fighting a 14 hour clock) and that ALL other time they spend working is not valued. We are asking for your help. Please take 15 minutes to call, email, tweet and/or Facebook your State US Senators and tell them to remove the anti worker language on page 38 & 39 Section 134 of the THUD Bill. Also, tell them to VOTE NO on the FAA Reauthorization anti trucker wage amendments. This language was originally included as the Denham amendment in the Fast Act of 2015. 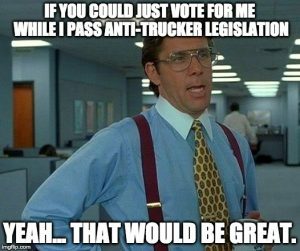 Fortunately, there were members of Congress who saw the ill affects it would cause to truckers and their families, and it was removed from the final FAST ACT bill. The ATA and their lobbying efforts did not stop. The toxic Denham language,( intended to injure truckers and increase company bottom lines), was tried again in the FAA and THUD in 2016. This anti trucker language aims to reverse and close the door on modernizing the way truck drivers are paid. 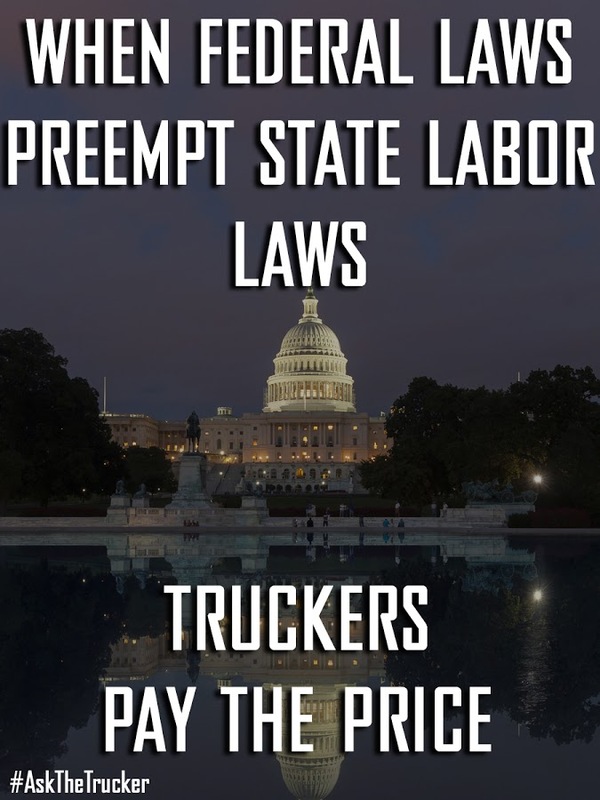 It would allow companies to continue a practice of not paying for detention time among other things and reverse State laws which protect truck drivers, recognizing that traffic and being delayed for loading and unloading can create a burden on truck drivers who are not being paid fairly for their time. Not paying truck drivers for all of their work hours defies safety, is anti worker and anti American. We do not want “government to interfere”- We’re asking Congress and the government to stay out of states affairs. There are states who have laws and believe that truckers should be paid for all their work, in addition to their miles driven. We’re telling government not to pervert laws which were meant to deregulate freight ( 1994 FAAA ACT). These laws were not meant to preempt states labor laws so that drivers wages could be regulated. It is the ATA and other of trucking industry who have vowed to change and distort the true intent of existing FAAA law. The circuit Courts agreed and the Supreme Court has refused to hear their cases. Now the trucking industry has gone to Congress to CHANGE laws for the sole purpose of ensuring truckers are not paid for the time they work. Just a note: 70% of truck drivers voted for the majority party that said they were going to fight for workers and this language definitely breaks that promise. 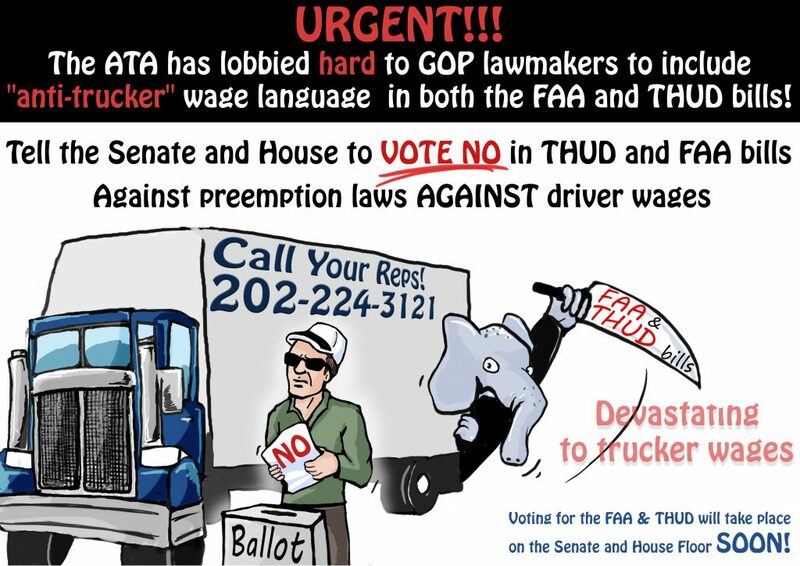 Vast majority of truckers voted for GOP who introduced anti trucker wage language in FAA &THUD bill. Many truck drivers are only paid when the wheels are turning which means some work unpaid hours up to 35 a week of their 70 allotted hours. This is especially true in the agriculture sector where Congressman Jeff Denham, his family & friends have agriculture & logistics business interests. The language also seeks to be retroactive which means that truck drivers who have won wage theft lawsuits against carriers could have those decisions reversed. Another weak excuse offered by ATA and others is , besides the altering of intent of the 1994 Federal Aviation Administration Authorization Act, is that it would be too difficult to keep up with different states labor law. Well here’s a thought for you, If you want to eliminate confusion regarding “different states labor laws,” then the logical conclusion would be to PAY TRUCKERS FOR ALL TIME! Problem Solved. MAKE THE CALL 202-224-3121 Example of what you can say. “As a trucker, I’m against the Denham amendment and the Fischer amendments to the FAA bill and the Denham Preemption language in the THUD bill 23 Section 134 under FEDERAL AUTHORITY. 23 SEC. 134. FEDERAL AUTHORITY. 22 395 of title 49, Code of Federal Regulations. tration Authorization Act of 1994 (Public Law 103–305).